Tales of Xillia 2 (2012 / 2014) is, obviously, a sequel to 2011 / 2013's Tales of Xillia, taking place on year later in the same world, and featuring much the same cast. These two games are set in two parallel worlds: Rieze Maxia and Elympios. Rieze Maxia is a land ruled by spirits of earth, wind, fire, and water, and its people use these spirits to aid their daily lives. Elympios, on the other hand, utilizes advanced technology in order to live, as it has no connection with the spirits. In the backstory of these games, Rieze Maxia and Elympios were originally one world, but the development of objects called spyrix began to destroy their enviornment. Because of spyrix, the two worlds were separated by the most powerful spirit, Maxwell. At the end of the first game the two worlds were united once again through the efforts of Jude Mathis, Milla Maxwell (originally Maxwell's puppet, she becomes the new Maxwell at the end of game), Alvin, Elize Lutus, Rowen Ilbert, and Leia Rolando. 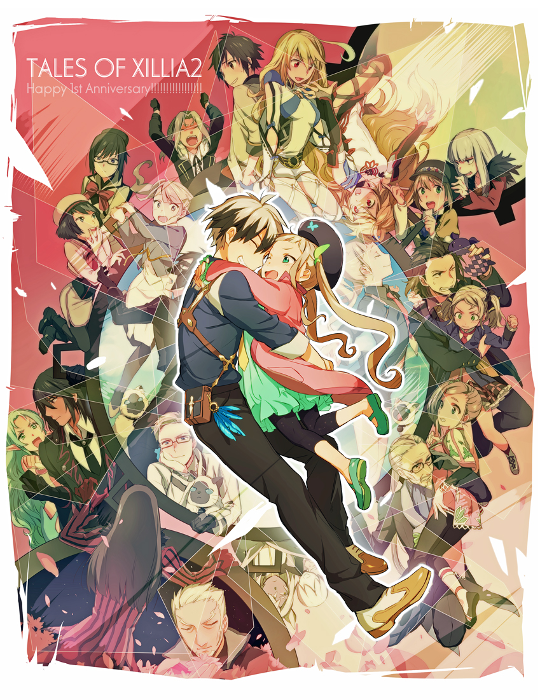 Although all six will have an important role in this game, Xillia 2 will instead follow the strange life of Ludger Kresnik and Elle Mel Marta, as a chance encounter between the two spirals into a fight for the world's future. The battles in this game are fought according to the Cross Dual Raid Linear Motion Battle System (Namco-Bandai's term for it), which doesn't particularly need to be explained here, as the system is not only very similar to the one in the first one, but will also be explained much better in the first few hours of the game. However, if you are coming into this game from the first one, you'll be able to get used to it very quickly. However, that is not to say it is entirely the same. More important is story progression. Unlike Jude and Milla, Ludger is a silent protagonist and the player will have the ability to choose Ludger's responses to NPCs and PCs throughout the game. While these choices do not substantially affect plot progression, there is a new affection system for three NPCs and all the playable characters aside from Ludger, so raising affection lets you see new scenes and even additional content to certain story sequences. This game, progression-wise, is divided into 16 chapters. To progress from one chapter to the next, you have to pay off debt, which is a mechanic introduced at the end of the introduction and forms the basis for the player advancing the story. Of course, I do not need to go into specifics at the moment. While there are choices, there are also *right* choices to make that increase character affections, and the choices I make in the game will be clearly indicated by my commentary. However, that is not to say I won't show off the alternates. At the end of each video, I'll post the results of the choices not made in the main update for your enjoyment. When it comes to one of Xillia 1's most popular features, dressing up your characters with all manner of goofy accessories and costumes, however, that can be arranged in the thread. I'll be going through this game again on a New Game+, which means I can bring all the cosmetic stuff over from my previous games. When I recruit every new character, I'll post everything I have for the character, and one lucky poster will have the honor of having their choices reflected in the update. Obviously, as a sequel, anything from Xillia 1 is fair game. The characters will frequently refer to characters, events, and plot-related stuff from the first game, and I'll explain references where appropriate. However, as of the posting of this thread, fellow forums poster wdarkk is Let's Playing the first game, so if you want to know where it all began, feel free to read that thread. However much I like the first game, I like this game even more. I hope you'll enjoy my take on the wild world of Tales of Xillia 2.